I snapped this shot using my camera phone, so the photo today is not the sharpest or clearest. Because I am still a dumb phone owner (and proud), the quality of the photo is not ‘smart’. 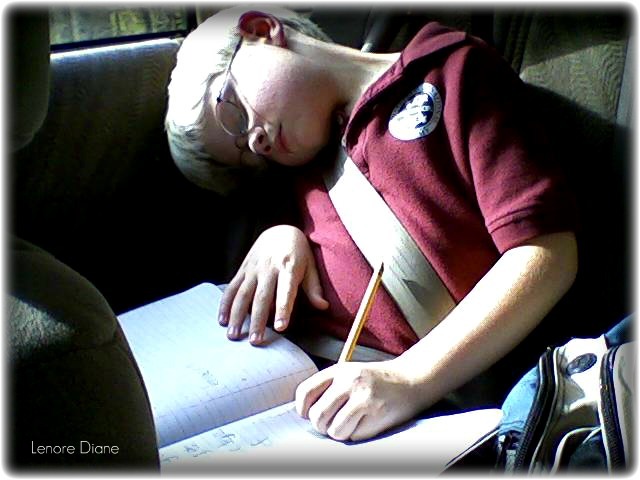 Sometimes, on the way home from school, Joe asks if he can start his homework in the car. His teacher discourages doing homework in the car, because she wants to make sure the child is truly focused on the work at hand. Still, I have been known to say ‘yes’, when he asks to do his work in the car. Hard day at work on Monday! Awwwww…..Love it! That’s pretty much how I felt yesterday! I want to know how he was able to keep his pencil in the writing position. And, that’s how I feel most afternoons. Tired little man! So cute! Actually, I’d rather snuggle up beside him, nap and let someone else drive. 🙂 He is precious, MJ. His brother was asleep, too. Hahaha! Have you learned your lesson? Will you come pick me up from work tomorrow? If his teacher saw this I bet Joe would get bonus points for some serious dedication! Actually, I should send it to her. She’d get a kick out of it. The writing gets a little harder to read the further you go along, though. Cute, and you got a picture, too! Your comment reminds me of high school and college, when I’d doze while taking notes. Come study time, I’d be lost with the ‘sleep writing’. Thanks, Patti! Oh my gosh! Too sweet! I am so glad I caught this moment. Glad you liked it, Bridget. CUUUTE! Hang onto the dumb phone. My dumb phone took much better images than my fancy Smart Phone! I’m hanging on to the dumb phone for another reason… I’m afraid I’d find texting way too addictive, if it was easier for me. As it stands now, I don’t text. Life is easier with dumb phones. 🙂 Thanks for visiting, Linda. Isn’t that funny? Thanks for visiting, Shannon.